Recent divergence-time estimates of the origin of the liverworts obtained using penalized likelihood suggest a Late Ordovician divergence of the liverworts (Heinrichs et al., 2007), based on a maximum age from Wellman et al. 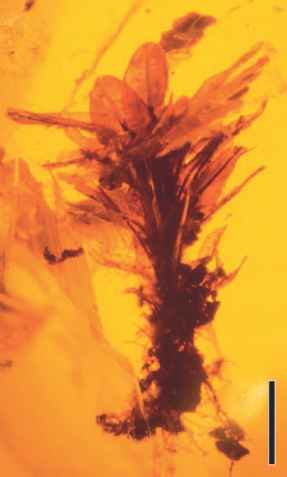 (2003) for the oldest fossils generally accepted as land plants, and Kenrick and Crane (1997a) for the oldest split of vascular plants. 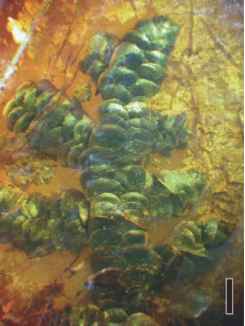 The earliest liverwort in the fossil record is table 5.1 Bryophyte genera known from amber. Citations for ages: Dominican (Iturralde-Vinent and MacPhee, 1996); Baltic (Weitschat and Wichard, 1998; Knuth et al., 2002, see discussion in Schmidt and Dorfelt, 2007); Bitterfeld (see discussion in Dunlop and Giribet, 2003 and references cited therein). Metzgeriothallus sharonae from Givetian (upper Middle Devonian) shales and siltstones from New York (Van Aller Hernick et al., 2008). The fossils are preserved as carbonaceous films, and display dorsiventral thalli up to 32 mm long and 1.5 mm wide, that consist of a median costa and entire-margined wings. What appear to be unicellular, ribbon-like rhizoids extend from beneath the costa. Associated with the gametophytic thalli is an elongate sporophyte capsule with four valves. Another slightly younger liverwort is Pallaviciniites (=Hepaticites) devonicus from the Upper Devonian (Frasnian) of New York (Hueber, 1961). The specimens consist of compressions preserved in a fine-grained shale together with numerous other plant remains. The liverworts were removed by bulk maceration (see Chapter 1) of the shale in concentrated hydrofluoric acid (HF); the carbonaceous, thalloid specimens were then floated onto microscope slides for examination. Pallaviciniites devonicus is a simple, two-parted, flattened thallus with a central midrib and marginal lamellae or wings. The thal-lus is dichotomously branched, and along the margin of the wings are closely spaced teeth. The rhizomatous portion of the plant shows outlines of elongate parenchymatous cells, some bearing non-septate rhizoids. No reproductive structures are known. 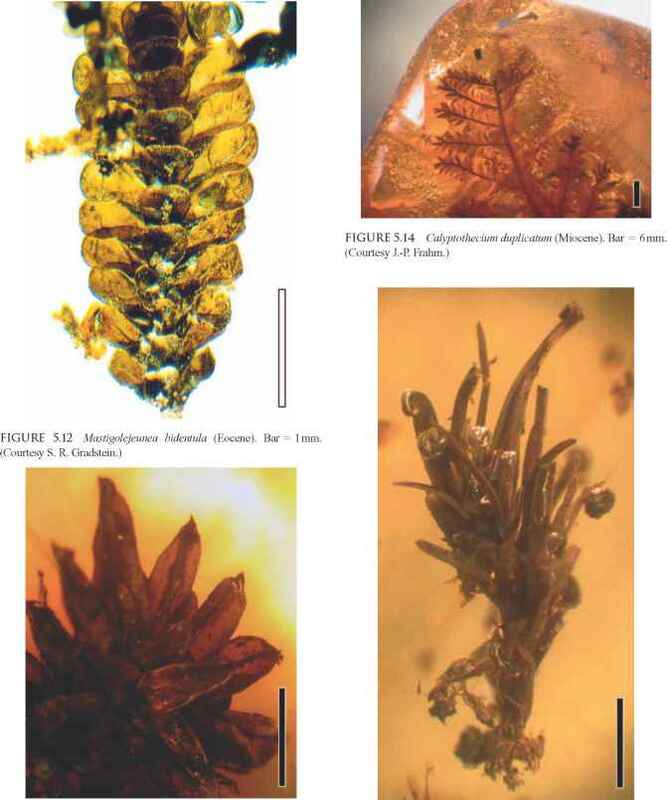 Various species of Pallaviciniites have been described from the Carboniferous to the Pleistocene, and they have been compared with such living genera as Pallavicinia , Metzgeria , Treubia, and Fossombronia (Schuster, 1966). Other late Paleozoic liverwort thalli come from the Carboniferous and have been assigned to morpho-genera such as Blasiites , Metzgeriothallus, and Treubiites (He-Nygren et al., 2006). Treubiites kidstonii from Scotland was initially believed to be similar to the extant Treubia , but later was shown to closely resemble extant Blasia because of its ventral scales (Krassilov and Schuster, 1984). regions contain numerous lamellae; the outermost region is granular. Based on a comparison with extant liverwort spores, the spores of Naiadita are most similar to members of the Marchantiales and Sphaerocarpales. The type of spores, presence of unicellular rhizoids, and organization of archegonia and capsules suggested to Harris (1938) that Naiadita represented a liverwort similar to extant Riella (Sphaerocarpales). Naiadita also shares some vegetative features with certain modern liverworts included in the Calobryales (Schuster, 1966). Late Paleozoic, Mesozoic, and Cenozoic impression and compression fossils of liverworts or liverwort-like thalli have been assigned to various morphogenera. These include: Thallites, for thalloid fossils that may represent liverworts or algae (Chapter 4), Hepaticites, for thalli that can confidently be assigned to the liverworts, but cannot be classified further, and Jungermannites, Metzgeriites, or Marchantites, for thalli that can be classified to the ordinal level within the hepato-phytes (Cantrill, 1997b). Liverwort thalli in general are relatively rare as fossils, but there are several reports from the Mesozoic, in which bedding planes, which sometimes extend for several square meters, are covered with densely spaced thalli (e.g., Banerji, 1989; Pole and Raine, 1994). In many of the liverwort-rich beds, the thalli are preserved in situ, and therefore are interpreted as colonization horizons of freshly deposited sediment (Cantrill, 1997b) , Beautifully preserved, compression fossils assignable to the Marchantiopsida occur in dense mats on bedding planes in the Aptian (Lower Cretaceous) of Spain (Dieguez et al., 2007b). These fossils consist of small, rosette-forming dichotomously branched thalli (FIG. 5.19). 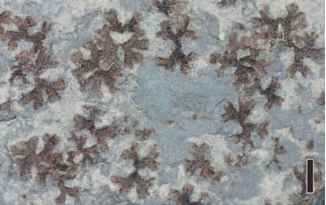 Marchantites cyatheoides and M. tennantii are impression fossils of thalloid liverworts referred to the Marchantiales from the Upper Triassic Molteno Formation in South Africa (Anderson, 1976). Marchantites tennantii has dichotomizing thalli (FIG. 5.20) , in which individual branches range from 2.5 to 4 mm wide, each with a prominent midrib <1mm wide. 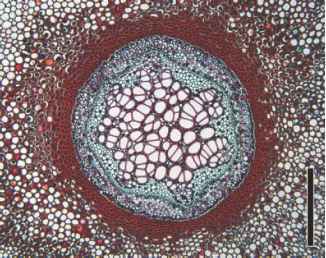 The lateral regions of branches have a surface pattern of polygonal areas between 0.75 and 1.5 mm wide that are arranged in rows arching away from the midrib. Similar patterns of regularly arranged polygonal fields are common in modern Marchantiaceae, where they represent the surface expressions of the subsurface air chambers. of Marchantites side. Marchantites rosulatus is a rosette-like thallus with individual thallus branches 3-5 mm wide. Thalli of M. taen-ioides are ribbon-like, up to 60 mm long, and only sparsely branched. On the dorsal surface are numerous circular-elliptical pores; on the ventral side rhizoids are borne along the midrib. The fourth species, M. arcuatus, has thalli that display open branching. The affinities of these taxa within the Marchantiales are based on thallus morphology and the presence of structures resembling air pores on the thalli. Other liverwort thalli from Alexander Island were assigned to the morphogenera Hepaticites and Thallites . Cantrill (1997b) noted that the liverworts of these late Albian floras were both diverse and abundant, and appeared to occupy a number of different ecological niches in this high latitude site. 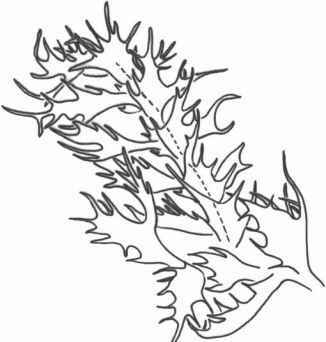 Based on an analysis of the 613C of the Cretaceous liverwort thalli from Alexander Island, and subsequent comparisons of the results with modern analogs, Fletcher et al. (2005) showed that fossilized bryophytes can be used to gather information on paleoatmospheric CO2 concentrations, and thus offer new methods and insights into paleoclimatic reconstructions. Marchantiolites is an Early Cretaceous liverwort from central Montana (Brown and Robison, 1976). One specimen is ~4 cm long and contains a prominent midrib. On the ventral surface are numerous rhizoids, whereas the dorsal surface displays air pores surrounded by specialized subsidiary cells. A slightly different air-pore frequency and morphology is present in the Rhaeto-Liassic (Late Triassic-Early Jurassic) species M. porosus from Scania, Sweden (Lundblad, 1954). As the name suggests, Marchantiolites has been included in the Marchantiales based principally on the general organization of the air pores. 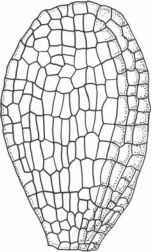 Lundblad (1954), however, noted that living species of Marchantia exhibit compound pores, whereas the fossil forms contain mostly simple ones. In general, the record of thalloid fossils interpreted as members of the Ricciaceae ranges from the Pennsylvanian (Walton, 1949a) to the Quaternary (Jovet-Ast, 1967); however, the affinities of most pre-Jurassic forms are still uncertain (Oostendorp, 1987). Fossil Ricciaceae are usually placed in the morphogenus Ricciopsis, but some have also been assigned to the modern genus Riccia (e.g., Sheikh and Kapgate, 1982). Ricciopsis florinii (Ricciaceae) is a rosette-shaped thallus from the Late Triassic-Early Jurassic of Sweden (Lundblad, 1954); it has four main branches, each of which dichotomizes twice. Although most records of fossilized ricciacean thalli come from Europe and Asia, to date only a single species has been described from North America, Ricciopsis speirsae from the Paleocene of Alberta, Canada (Hoffman and Stockey, 1997). 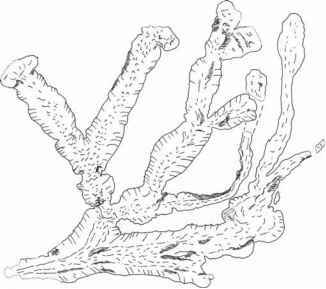 This form differs from all other living and fossil Ricciaceae by displaying occasional constrictions and dilations of the repeatedly dichotomizing thallus. These fossils occur in what is interpreted as an oxbow lake deposit, along with lemnaceous angiosperms. Extensive occurrences of fossil Ricciaceae (e.g., Ricciopsis algoaensis) are known from the Lower Cretaceous (Berriasian-Valanginian) of South Africa (Anderson and Anderson, 1985), and dispersed ric-ciacean spores of Paleocene age have been reported as rare elements in the Sonda coal deposits in Pakistan (Leghari et al., 2001). Another interesting fossil liverwort is Diettertia, a Cretaceous form from Montana initially described as a moss (Brown and Robison, 1974). Based on additional material, Diettertia is now regarded as a bilaterally symmetrical, leafy liverwort with affinities to the Jungermanniales (Schuster and Janssens, 1989). The gametophyte consists of unistra-tose, bifid leaves inserted in two ranks on stems approximately 0.5 mm in diameter. Rhizoids are long and slender, non-septate, and up to 25 |m in diameter. Many features of Diettertia suggest that it represents a highly specialized member of the Jungermanniales. As a result of this fossil and other evidence, Schuster and Janssens (1989) suggested that the order probably evolved much earlier, perhaps in the late Paleozoic. fossils of species that still exist today, and thus indicate that these species are archaic and already existed at least by the early Neogene, 20 Ma (Gradstein, 1993).